We’ve all seen cars lap the Nurburgring quickly. It’s not such an impressive feat anymore – give anything sticky tires, a fancy electronic differential and a fearless German driver and it will probably navigate the 12.9-mile ‘Green Hell’ rather quickly. 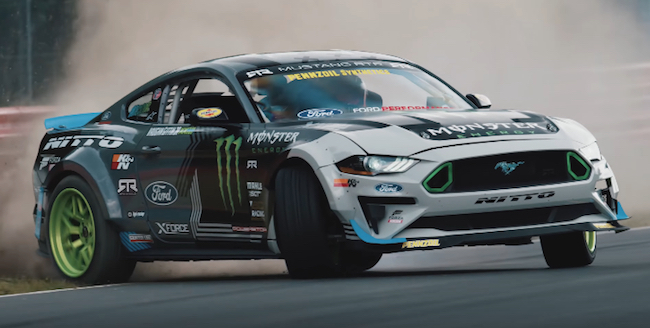 Ford Performance and professional drifter Vaughn Gittin Jr. must have thought the same thing, because rather than just driving around the world-famous German circuit, the American driver has drifted it. Yep, the entire thing. All 12.9-miles of it – Karussel and all. Gittin Jr.’s feat is certainly impressive, but he couldn’t have done it without the proper machinery. His drift-spec Mustang RTR features a 5.0-liter V8 with a Vortech supercharger putting out somewhere between 700 hp and 900 hp, which is paired with a 6-speed sequential gearbox from PPG Performance. Surprisingly, Gittin was on road-legal NT555 G2 tires for the record-breaking run, although they didn’t hold up for the entire lap. Check out the hair-raising drift run in the video embedded above.